Hi everyone! 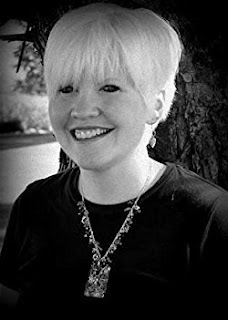 It's been a while since I've introduced you all to a fabulous indie author, so let's rectify that by dragging one of my Twitter sisters over to the hot seat! That's Twitter sister, not twisted sister, though really, I'm not sure there's much of a difference when it comes to the authors I proudly claim as my second family. Shannon Reber is family. You may recall that I reviewed Shannon's first novella, The Seer last year as part of my Write On! review segment. Well, in the year since, this gal has penned a total of eighteen books. Yeah, let that sink in! Eighteen books! AND she'll be offering five of them for free this Friday, January 13th as part of our SIA Showcase event. Which is why we're here today, Shannon's lucky eighteenth book, Friends and Foes, just launched today. To celebrate, I sat down with Shannon to discuss the new book, her other books, life as an Indie author, and which Twitter sibling is the best (spoiler alert, it's me). CHRISTINA MCMULLEN: So Shannon, let's get the important stuff out of the way. Tell us about the new book and why we should all run right over to Amazon and throw money at you? SHANNON REBER: Because my book is fabulous!!! Duh. Honestly though, it's my favorite one I've written. Emery is this sweet, naive, snarky little thing who makes me laugh as I write her and will hopefully make you fall in love too! It's an adventure, a love story, a fantasy phantasm of fun! CM: And this one is definitely fantasy, but it looks like it also takes place in our world? CM: Hmm, Western New York isn't that bad though, for you weirdos who like the cold! I assume Iowa would have snow too though. SR: Well of course it does! All GOOD places have snow, dude. CM: So to go off topic for a moment, what's with you and cold weather? SR: LOL, boots sista. Boots. I can't wear them without looking like a complete tool during the summer! CM: You obviously haven't been to Texas. Boots are worn all year 'round. But that's a different story. The story where I drag you down to Texas. But let's get back to your stories. You write a lot, as I've noted, but you tend to stick to the broader fantasy category. What's your favorite out of all the books you have written? SR: Fantasy is the only way to go in my world. It's a complete escape from reality. All the mundane details of life fade away when you're wrapped up in a story where people have powers and evil villains are out to get you. My favorite of my own books used to be Gray (Awakening Book 1) but Friends and Foes has now taken the cake! Ooooh, cake. Wait, wait...back to the books. *Giggles like a huge dork. * Other people's books though, I have too many favorites even to name. Tolkien, CS Lewis and this fabulous author named Christina McMullen...just to name a few. Get me away from reality and I'm all good! CM: Christina who? Ugh! Not her again! So what's next? You've written eighteen books in just over a year. Are you planning the next eighteen? SR: LOL, I'm planning the next hundred and eighteen! I have two different series to finish off, not including The Druid Heirs trilogy, but when those are all finished, I was thinking about writing something like a prequel for The Uniters Code series. It would be how The Uniters came to be, who founded them and how the war began. If not that one, then one, or two, or twelve others might be floating around. Oh and I also need to think about painting again, but I've been so obsessive about writing, it's fallen by the wayside. Wait...did I just admit to being obsessive. Woops. CM: That's right! I almost forgot, you're an artist too! Geez! Save some talent for the rest of us! But seriously, I love that I know so many indie authors who are also visual artists as well. Would you say there are similarities between the two mediums or are they separated in your mind entirely? SR: I see them as exactly the same! A painting tells a story, you just have to make it up as you look at it. And talent is the last thing I'd call what I do. Mine is just a determination get some of the crazy out of my head. Writing, painting...my mind tries to release my weirdness that way, but it just holds on with both hands! LOL! CM: There is nothing wrong with weirdness. After all, we excel at it! And speaking of that, let's get personal for a moment. As I've revealed to the world, we are sisters, not in the biological sense, but in that we have formed some sort of a weird family dynamic on Twitter among a small group of authors. Obviously, I'm your favorite, but let's look at this from a different standpoint. You, me, and our other siblings have never met in person. Are we as real as real life friends? SR: You are definitely my favorite, mostly because you're as in love with coffee as I am! And uh, you guys are FAR more real! You guys are there with me all the time, the voice in my pocket that always makes me smile, or sometimes roll my eyes. I spend SO much time in front of my laptop, without you guys, I'd be a mess! You should totally consider yourself hugged by the way and maybe we should have a coffee to toast our Twitter-kinship! CM: Aw! Thanks! I ask because I think that's the one thing people tend to forget about us. As indies, we're really more accessible to readers than some of the other authors who might have a few billion more fans and dollar than us. We're real people! We have feelings! So come talk to us, right? SR: Right! I've had SO many conversations with one of my fans on Facebook! I love hearing about what she thinks of my books, etc. And seriously, if my phone dings to tell me there's a message, it makes me giddy. Will it be Christina, Dan, Ben, CB...Ellie, Ana...ok, I won't list them all. Twitter rocks, this is what I'm saying. CM: I recognize some of those names! Well, sis, I've probably kept your phone dinging for too long, so we'll wrap up this interview. Before we go, is there anything we missed that you feel is super important for readers to know? CM: I can't argue with that! Thank you for taking the time to talk to me! SR: No problem! Thanks for interviewing me and being so stinking fabulous! The people of Avalon think that Emery is a disgrace. They all have access to many forms of magic, but Emery has only one. Or that's what they always believed. After a brutal war, the new Queen of Avalon sends Emery to the human realm to find the last druid. Emery takes that mission eagerly, certain it's a sign that, unlike everyone else, her mother may have some faith in her. Her mission, to bring Liam, the illegitimate son of the former king and bring him back to Avalon is no easy feat. Mercenaries are also searching for him, but the biggest problem for Emery, is the linked formed between them when Liam's power touched her. Now, she has to figure out what the truth is, who is right, who is wrong, who are friends...who are foes. Can she figure it out before something terrible happens? 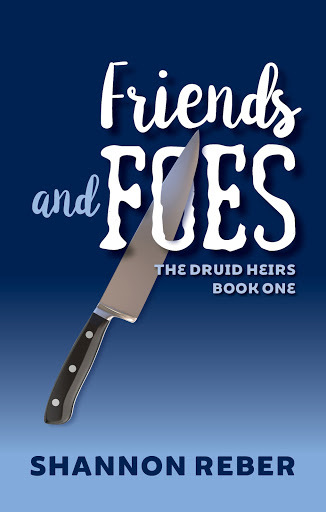 Friends and Foes is available right now on Amazon for the Kindle e-reader. Want more? Watch the trailer HERE Or listen to Shannon read an excerpt HERE. Shannon Reber was born a long time ago in a galaxy far, far away . . . or her imagination was anyway. She lives in western New York with her husband and a wide variety of both real and imaginary friends who often battle it out for dominance in her head. Who needs yet another normal person in this messed up world? Read her books, or the evil overlord will take control of her mind! Nice interview...her books sound great!